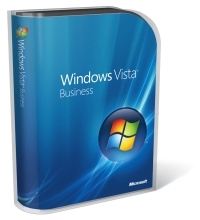 Windows Vista Business, as the name implied, is meant for businesses and commercial companies of all sizes. Windows Vista Business includes every functions and utilities that an organization needs to ensure that the computers and laptops are running smoothly, securely, reliably, requiring less IT support. Beside, Vista Business also make it easier to organize, find, and share information while staying better connected with wireless access while offline on the road. You can view all additional features that Business edition has at Windows Vista Editions features comparison, and the price for retail, OEM or upgrade Business edition.